DCI-Switzerland, in collaboration with the International Secretariat (DCI-IS), continues its juvenile justice programme. Several researches were initiated to gather data and information on the current situation of juvenile justice in the country. Existing laws were identified and testimonies on juvenile justice practices were collected. One of the goals was also to discuss current gaps, as well as good practices in the area of juvenile justice. 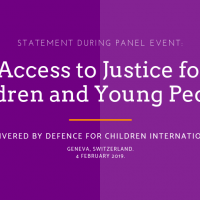 DCI-Switzerland also campaigned to raise awareness on how the lack of financial and human resources allocated to the juvenile justice system influences the conditions of children in detention. More precisely, it was highlighted, how ill-equipped detention centers are for children and how this violated children’s rights and ignores their specific protection needs.